Guess what, with this post I'm hitting 35 in a month which means more than a blog post in a day. Insane!!!!! Our HeX liveCD great graphic designer - Vickson has sent me the CD label that he has just redesigned and asking my opinion about it. This is almost the final version of the CD label for HeX liveCD version 1.0 after some discussion and modification ongoing between me and some of team members, I would like to put it up here and sharing with everyone. To protect his artworks, I have told him to register under Creative Common License. For better view, click on the picture to zoom in, let us know what do you think about it? Thanks to Bro team which has published the workshop materials online so that we can learn more about Bro internal. While I have been using Bro in Operational Network, I haven't actually learned about Bro Scripting Language. Therefore I think those materials will be ice-breaker for me because it really makes thing clear and I plan to finish all the exercises to further sharpen my skills in operating Bro. - i.e. no presumption of "good" or "bad"
This is exactly similar to NSM concept where we don't assume any alert events provided by IDS as intrusion or extrusion without further confirmation and verification with the subsystem given. I would love to see all of them integrated to Bro in near future as it will benefit us with both low or high end hardwares. With Netflow Analyzer added that is plus point as most of the companies having Cisco router deployed in their network, or you can use fprobe if running *nixes network appliance. Think again about the approach, is Bro a Network Intrusion Detection System? Again I have to emphasize, NSM analyzt is da future! Me and Mel have discussed about running non-profit honeynet group to research on internet threats and attacks trend for a while, and finally Mel launched the website about the group after long delay. We are currently running low level honeypots to capture malwares and plan to deploy high level honeynet once we have found the sponsors because more costs intact in order to operate them. And that includes raWPacket team members too. Of course if you are interested in the project(researches, contributions, sponsorships), feel free to email us, you can either contact me or Mel. We hope this can be the long term R & D with the supports of various parties, and the outcome value is definitely worthwhile. Beside Snort, Bro-NIDS is another one of the most powerful open source NIDS that developed by Vern Paxson and his team with community supports. It could be deep pain if you want to read them, don't you? Therefore it becomes unclear when one first learn about Bro and want to proceed to examine the logs but don't know where to start. Here I will give you some insight of how I perform analysis using Bro but I need another powerful tool to assist me, I vote ourmon! While L means connection is initiated locally. Here you go, you are now having full understanding of the network connections(all those http requests with same tag number), this is kind of batch analysis to identify network events. I don't explain how I make use of ourmon here or maybe I will make it for future post. 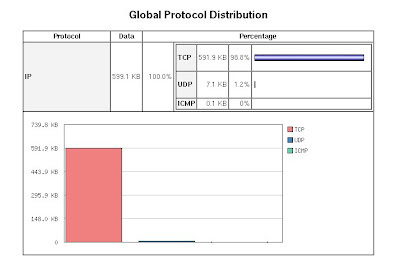 Ourmon generates the graph by plotting such as TCP flags ratio, network errors, irc stats and some other graphs that you can correlate with the data provided by Bro to fully understand your network and readily countering any network threats. Just discard t= and parse it to cf. Bingo! Piping to less command is also great because you can perform certain function such as search by regular expression, easy log navigation and so forth(vi style functions). Both Bro and Ourmon provide you great context for most of anomaly network events, I have spent my time to figure out the better way to utilize them and hopefully this help anyone who uses them because I did face difficulty when first dealing with Bro that it seems to require more man power to examine them. One more tip, remember to turn on dynamic protocol detection(DPD) when dealing with stealthy attackers. I use color depth to indicate the understanding level of the network event. You may see the color in the entity becomes lighter and lighter from left to right when you have better understanding of network event through out the structural analysis process. What's the lacking in Bro? Clearly enough that it really needs better way to organize and manage its logs and perhaps OSSEC can fill the gaps with additional log parser. Using this mechanism with the deployment of Snort NIDS, I'm pretty confirmed that you can identify known and unknown(0 days) network attacks. You can click on the image to zoom in, but the image quality is so bad until you can't really read, I know you spammer want it to be small size(68K) only but please deliver with better quality image so that I can read or else how I gonna invest? Thanks to Mr. Chan who has given me opportunity to join the company, I greatly thanks to everyone who has been working closely with me especially Andy, Jackie, Albert and Guan who has been very supportive(sorry to disclose your name and don't get mad if your name is not listed :P). At the same time, I also greet the whole technical team which dedicated a lot of times and efforts in maintaining the server farms, you guys are just awesome! I have been involved in many network security operations such as incident response, vulnerability assessment, network forensics and so forth. This is greatly improving my technical knowledge to face new challenge in my next career. It is undoubtedly that I have mix feeling because I have to leave Pulau Penang and moving to somewhere soon, I must say I love this island very much, great people and delicious foods here. Hopefully the new place won't be disappointing me. 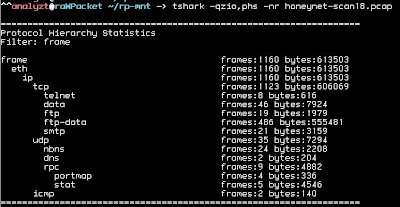 We have included Ntop in our liveCD and here's the simple how to use it to perform offline processing on pcap data, it's another useful to generate network statistic besides tshark and tcpdstat. I always use honeynet-scan18.pcap as example as it is publically available here. Credit to honeypot team for making the trace available. The down side about ntop is that it will purge the old data therefore you only view the latest data displayed, if anyone of you(experience Ntop user) know how to disable it, please share it with me because I would prefer to use it to process the pcap offline. If you would like to have high level understanding of the network data, chaosreader is definitely a good choice. fl0p is a passive L7 flow fingerprinter that examines TCP/UDP/ICMP packet sequences, can peek into cryptographic tunnels, can tell human beings and robots apart, and performs a couple of other infosec-related tricks. GNU make not found; failing back to regular (BSD?) make. I'm currently having a lot of signatures collected but having no time to examine about them yet, guess I need some spare time for that. I think many of you have heard about argus from my previous blog post. Here's how I maintained my argus installation in my testing environment on FreeBSD platform. I have mentioned about the usage of stow previously, you can easily handle source installation with it. If there's new version of argus released, you can just unstow and remove all the argus file from /usr/local/stow, then install the new version using the same steps above and you are done. If you want to try out argus 3, just download HeXtra here and load it to HeX liveCD will do. Talking about Network Based Forensics, are you going to perform batch analysis on each files that you obtain via network data through network forensics mechanism? Even if you able to examine each file transfers over network, can you really dig into the details of every single code? Remember malicious contents can be hidden inside picture file(stenography), simple backdoor can be injected into the normal application and so forth, and how do you able to examine every single binaries? Do you have enough resources to perform this kind of operation? How do you examine encrypted connections, any trail? Therefore it still falls back to the NSM concept. I have seen expensive commercial system that can extract all the files and categorize them reliably, however I swear I don't want to examine those files one by one, it's too costly and exhaustive. I do agree those data can be stored as historical purpose but doing data mining on them requires better mechanism, and if you know Network Security Monitoring well, I think you will get what I mean as better mechanism. NSM allows you to research on different area if you ask me, you can study on Network Statistical Analysis, Network Flow analysis, IDS log analysis or even data mining on raw network data(usually pcap). 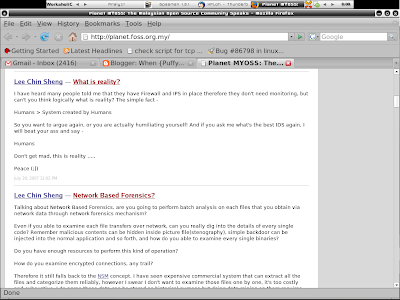 So you say you want to learn Network Based Forensics, then you should again rethink about NSM!!!!! In fact, we don't need IDS analyzt but NSM analyzt. I don't know what else is good but they all work pretty well. If you have any QT based application that you think is great, just share it with me. Thanks! There you will have protocol hierarchy displayed, or you can also use tcpdstat as well to compliment the output. Choice 1: If you have Windows then disconnect the external devices by clicking on the 'Safely Remove Hardware' icon in the Windows taskbar then shutdown Windows cleanly. WARNING: Forced mount, reset $LogFile. 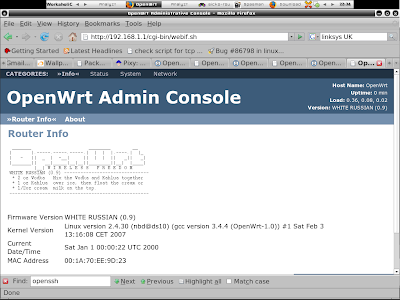 drwxrwxrwx 1 root root 4096 Jun 11 15:16 .
drwxr-xr-x 86 geek00l geek00l 12288 Jun 11 16:07 .. Thanks to Nikns again for sending me this information and I think it would be great to share with everyone especially OpenBSD users who need Wireshark for life. In 5th of July, new wireshark version 0.99.6 is released. Many of us, who uses OpenBSD has need to use wireshark. However, ethereal (now wireshark), has been removed from OpenBSD ports tree long ago due to the bad security record where many vulnerabilities have been discovered in dissectors code. If run with root privileges, wireshark, tshark and dumpcap will drop privileges to unprivileged user "_wireshark" after opening live capture device or dump file. For me I think it's great to have Wireshark on OpenBSD not for the purpose of network sniffing/logging instead of using it for network analysis, therefore thanks to Nikns putting the effort in maintaining the unofficial port himself. Jun 21 11:14:42 trinity usb-storage: *** thread awakened. Jun 21 11:14:42 trinity usb-storage: *** thread sleeping. We all love big storage, don't you? 0x0000: 0016 b681 3b0e 000a e435 ea8e 0800 4500 ....;....5....E.
0x0040: 2f7c 5057 440d 0a /|PWD..
(10:19:27) friend: and that represents for? (10:21:12) me: remember for all layer, it counts starting from 0 byte offset. You may notice I didn't highlight the ascii on the most right(3rd) column, because it is totally meaningless to examine the ascii data when reading the layer2, 3 and 4 header in most circumstances. What about the remaining 5 bytes - 5057 440d 0a? 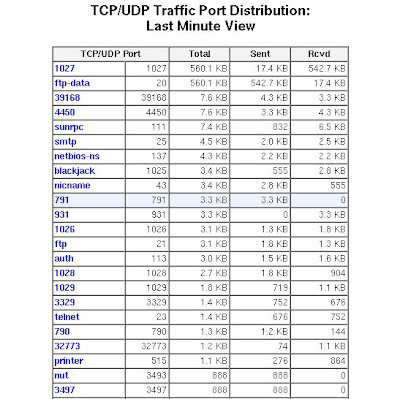 This is definitely FTP traffic(notice port 21 highlighted) for this case, and the reason why I highlight the ascii now is because it is the application data that you should examine, PWD is print working directory when you check the RFC here, 0d is carriage return and 0a is newline or usually be recognized as \r\n. Hopefully here I have clear the myth of tcpdump output for some of newcomers who want to learn about reading tcpdump output, it's not so hard to decode them when you understand. I don't explain every single field in the header yet but maybe I will make it next time if I'm in mood. I know some of you prefer to use wireshark as it generates more human readable output by decoding every single field correctly but I would say it is meaningless if you generally have no idea about networking therefore it's always good to go back to basic. Thanks to my friend who works in network hardware line so that I can obtain this device locally. I'm lucky enough to get this linksys wireless router model WRT54GL of which I can install linux(OpenWRT) on it flawlessly, all I need is just upload the firmware that provided by OpenWRT and update . I follow the instructions here to get it install. I'm planning to install other applications such as fprobe and kismet for the fun of it. I just learn that IPKG is nifty packaging system for embedded device. By default it's LAN interface has IP address 192.168.1.1, I login to the web interface via firefox browser that you are seeing now, you can setup the password and the default user name is root. Since I'm the subscriber of the Best ISP here for their Screamyx package, I just need to setup PPPOE for the WAN connection, configuring the user and password for the pap authentication and I'm done. If you find yourself *nix head, then you can ssh into the router box as well, of course the main user is root and you can change the password from here as well, everything can be configured via CLI console. This is what I want, I have bought another box mainly for war driving purpose, the changeable antenna is definitely a plus point. If you want to know the prize, it is about RM220. 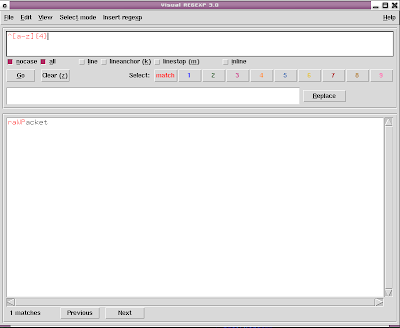 I install it via gentoo portage, the GUI interface is pretty simple and straight forward, what you need to do is just type in the keyword you want to match in the lower input pane, then construct the regex pattern matching in the upper input pane, then click on go button and you will see the part that is matching will turn red color, this can help you to understand how regex works and also create more accurate regex pattern. Once you have mastered regular expression, you will be more handy in using some of the shell tools such as egrep, sed, awk and more proficient when you need to write signatures for analysis tools such as ngrep, snort, bro-ids and so forth. That's possible to retrieve Outlook 2003 email but it requires more works and the pst file size must less than 2G or you will have to split it before converting it back to older pst format so that it can be parsed by readpst. I should have read Real Digital Forensics so that I won't need to google around because it is introduced in Real Digital Forensics book as well, anyway have fun. After l have read the interesting example in secviz.org, I decide to try the argus graphing example using afterglow and graphviz tool, however I'm lazy to change the IPs in my pcap file that contains p2p traffic to protect the privacy, hence I decide to use one of the tool bundled in argus suite called ranonymize(the name tells the story), I converted my pcap file to argus file format so that it can be parsed by argus suite. 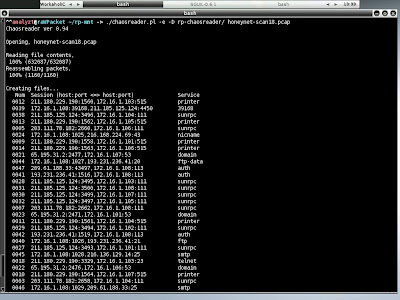 Now you will have p2p-anonymize.gif file in the current directory and here's the simple graph. You can see all the IPs are already been anonymized but you get the idea of the flows. Instead of reading pcap raw data, sometimes graph helps. If you have any thought about the liveCD, just let us know! I have previously installed ourmon 2.7 on FreeBSD that you can find here, since ourmon is great with all its meaningful graphs(of which I think it makes sense to network security analyzt instead of those I have seen in commercial systems(don't ask me which one) where all the graphs are generated on behalf of your management that has little or no value to us. Just launch the web browser and point it to the box that running ourmon will do. 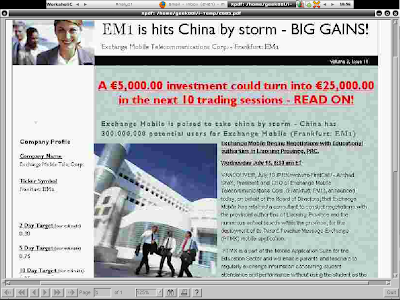 You will see the similar web interface like the demo above. Please keep in mind this is not the best deployment but quick example to get it work. I bet that will attract more users, what a niche way to increase Ubuntu Linux user base!!!!! All the tools reside in its specified directory and you can run them any time by now. On the other hand, we have also included clamav signature database to make it easy for user who want to use clamAV, snort signatures are not included but you can easily fetch it using oinkmaster, I will write up the howto later. I have also added the script call NSM-Offline.sh which you just need to run it against the network data(pcap) and it will generate NSM output for examination. Credit goes to Niklas who has initially written this script. I just modified it to run flawlessly using this liveCD. Make sure you have snort signatures in place in order to run this script as well. Thanks to Dr. J who is kind enough to provide the bandwidth for our liveCD download mirrors, if you are in the other part of the world than Asia Pacific, you are encouraged to download from those mirrors instead. Last year, me and mel have conducted the training at HITB conference. The training is about performing network traffic analysis using NSM concept but more on threat centric. We are also adding the part Network Based Forensics and discarding Host Based Forensics this year to make it more compatible to the topic. Again this year, we will be conducting the training at HITB conference again, however all the students who attend to the training no longer need to load the VMware image in order to use all the analysis tools but utilizing the HeX liveCD if possible(in case if the laptop brought by the students not FreeBSD compatible, he or she can still use VMware/Qemu to load the liveCD but we are trying to avoid this condition so that you can make full use of your computer resources. There will be updates for our training contents as well to cope with the whole network security scene. If you are interested in the training, feel free to check it out here. I think problem with the liveCD is its customized environment, for example if I'm familiar with linux but not bsd, then I have to dig into google to get some setup done because of different approach in setting up stuffs(sys v and bsd style for example), only who develop the liveCD can make use of it efficiently because he or she knows the environment entirely and familiar with the operating system. Different liveCD is developed for different purpose, many prefer end user based liveCD, security liveCD(penetration testing and hacking), forensic liveCD and thus far, I have never seen any liveCD that mainly develop to perform Network Security Monitoring operation. I do know Knoppix-NSM and NST, but their design is more for real time monitoring with NSM Based tools but HeX is more emphasizing on reactive NSM operation and Network Based Forensics. For me I prefer to call this as Network Data Analysis Centric liveCD and it can be learning tool as well if you are interested in NSM. First of all, I must admit I love two specific liveCDs - Backtrack and Helix. Both present really good idea to serve their purpose. Guess I don't have to speak about Backtrack anymore as I guess most of the people in security industry find it useful, on the other hand Helix is liveCD mainly developed to perform computer forensics in Incident Response operation, you can easily create the case and duplicate the data with Helix and it offers wide range of Forensic tools as well to do the job. And they are not those throw in new logo and install all the tools without customization liveCD which I hate the most. I would like to draw a beautiful diagram for this but I just want to show the simple quickies. As a analyzt(especially in reactive NSM operation), we need to obtain network based data first, then using all the necessary tools to generate the output(I prefer to call it output because it means nothing if you don't understand them), then interpret the output(this part is pretty dynamic based on the skills level, however the more you understand about each field that presented by the output and the more you practice, you are getting better and efficient). To analyze the output, it is very dependent based on your experience, knowledge(TCP/IP, Programming) and how efficient you can make use of internet resources, Once finished the analysis part, you will have to conclude everything you have studied, and summarize the output. At the end, write the report with hostility but keep in mind the report does present how well you understand the output and translate it to concrete form. To further improve the usage of the liveCD and share it with the community, great documentation is a must. Therefore I will start writing a series of how-to guideline so that people who are interested can make full use of this liveCD and learning tips and tricks on using NSM based tools. Hopefully it can fill the gaps and you all love it. Have I mentioned my Network Security Analyzt Handbook? It's in the progress now and hopefully you can use it inline with this liveCD soon. HeX liveCD 1.0 Beta: ReadyBoost? I haven't tried out Windows Vista but some of my friends are using them, and they are showing off this feature to me call ReadyBoost where you can just plug in your flash drive and it will be the add on "Memory" to boost the performance. Sorry to say that I'm not impressed. ReadyBoost????? We have SwapBoost since long time ago!!!!! Today is great day for us, finally we reach 1.0 beta milestone!!!!! Thanks to all members that have put a lot of hard works to get it done, and I also feel thankful to my friends who have contributed some of their configuration files. We are out of schedule but consider ourself meeting the timeline(though we plan to release the first beta by end of June but now is just early July!). As usual, any valuable feedbacks(suggestions or critics) are welcomed, however keep in mind that make love no war.